This is the first in a four-part series that highlights differently-abled artists and runs throughout Alternate ROOTS’ Artability campaign, which provides scholarships for artists with disabilities to attend ROOTS Week. To learn more or donate to the campaign, visit the Artability Indiegogo Campaign. There was no question that our first Artablity Artist Spotlight would feature Camille Shafer, the founder of the Artability scholarship and an incredible artist in her own right. Camille began Artability only a few years after joining ROOTS when she noticed both a lack of artists with disabilities and conversations about access and ability at ROOTS Week. Funding the scholarship out of her own pocket, Camille “put her money where her mouth was” (to use her words) for more than a decade until she was no longer able to do so this year. 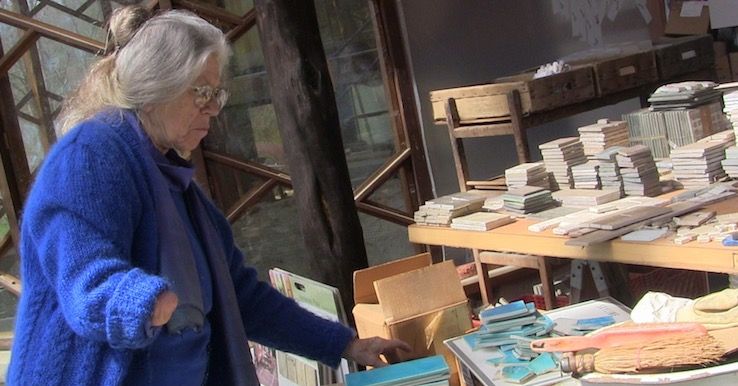 Camille Shafer begins a 2000 square foot mosaic project at Azule, with tiles she has collected over 40 years. For Camille, the Artability scholarship wasn’t just about creating opportunities for the artists it funded. As she describes in this interview on the ROOTS blog, “the scholarship was as much to benefit able bodied people as to benefit people with disabilities.” Camille continues, “I think that people with disabilities bring a lot to the table. I think they help more than they are helped themselves.” At the heart of the Artability campaign, then, is the belief that expanding ROOTS’ ability diversity benefits everyone at ROOTS, inspiring us all to grow as artists and cultural organizers. 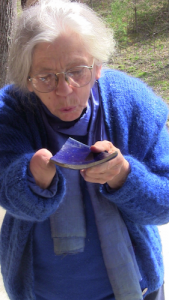 Camille dusts off a piece of tile. Camille is matter of fact about this point: “with the influence of people with disabilities, I make better art.” This belief is made tangible at Azule, the arts and community incubator she and her late husband Dave founded and built outside of Hot Springs, NC. Some of Azule’s design was inspired by the need to make it accessible for Dave’s wheelchair. Interior spaces were redesigned, and, in order for Dave to see the sky from his bed, Camille built a skylight in the ceiling out of an old glass door. Please help carry out the work that Camille started by donating to Alternate ROOTS’ Artability Campaign. Those who give $500 will receive a poster of one of Camille’s quilts; those who give $1000 will receive one of her quilts on printed canvas. 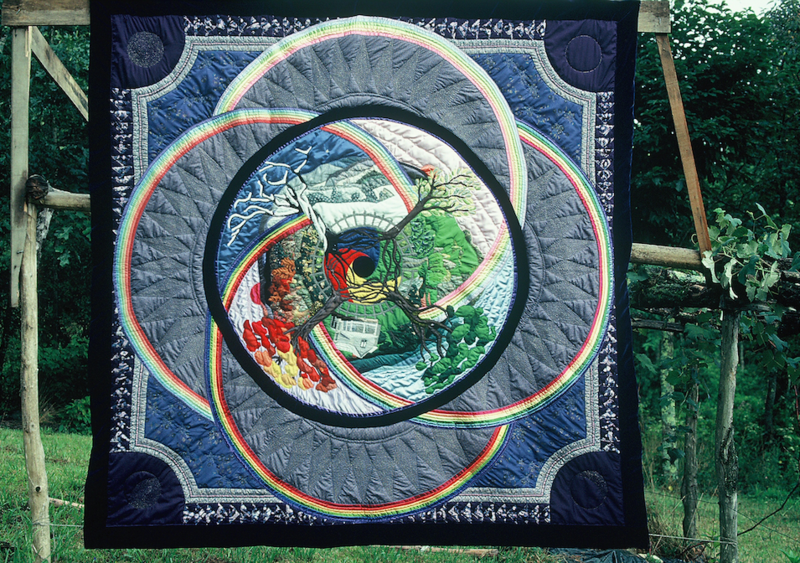 Camille’s Four Seasons quilt, one of her many museum-quality quilts. Nicole Gurgel is a writer, editor, performance-maker, and community-based arts educator. Born and raised in Wisconsin, Nicole has been working and learning at the intersection of arts, activism, and community for over a decade, in Minneapolis & St. Paul, MN, Chennai, India, Blacksburg, VA, Austin, TX, and now Albuquerque, NM. She holds an M.F.A. in Performance as Public Practice from The University of Texas at Austin and is passionate about sharing the stories of artists and organizers engaged in the work of social justice.